Who doesn’t love roasted red potatoes? 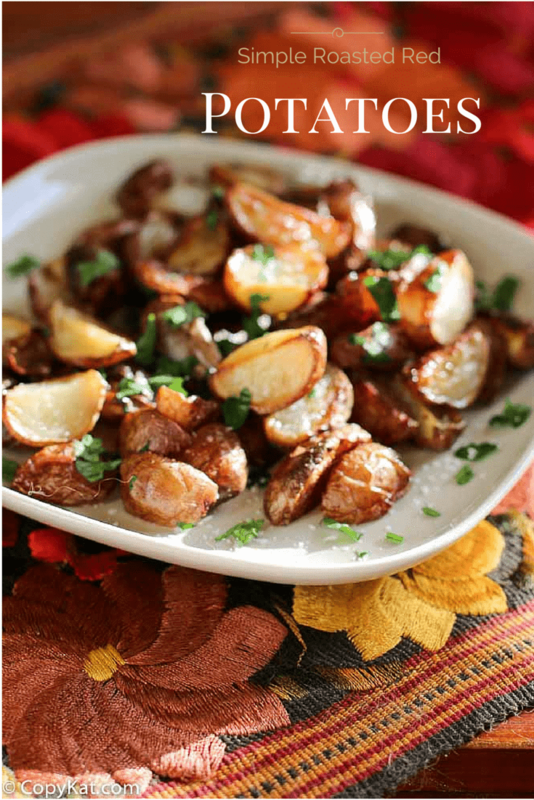 This is the perfect side dish it is so easy to make, in fact, you will be calling them easy roasted red potatoes in no time. If you are only familiar with large white potatoes, check out the potato section in your local grocery store and look for the distinctive red skin of red potatoes. Red potatoes are typically small to medium-sized and round or a little oblong in shape. When cooked, their texture is moist, smooth, and creamy. They are best used for roasting or mashing, or in soups and stews. Some people even boil these potatoes, let them cool and then add them to salads. If you are only familiar with large white potatoes, check out the potato section in your local grocery store and look for the distinctive red skin of red potatoes. Red potatoes are typically small to medium-sized and round or a little oblong in shape. When cooked, their texture is moist, smooth, and creamy. They are best used for roasting or mashing, or in soups and stews. Some people even boil these potatoes, let them cool and then add them to salads. Red potatoes are sometimes sold as “new potatoes,” because they’re often harvested before they have grown to full size. Red potatoes are sometimes sold as “new potatoes,” because they’re often harvested before they have grown to full size. People always ask me what type of oil to use. For this recipe, I think vegetable oil works well. Honestly, if I’m baking something, or I’m using something with a lot of aromatic ingredients, I’m simply going to use the least expensive neutral tasting oil I have on hand. I don’t think you get great value out of using more costly extra virgin olive oil when you cook a dish. Heating extra virgin olive oil tends to cook out the wonderful flavors of the oil. So I will use vegetable oil – canola, soybean, sunflower, or whatever I have on hand. Do you need the potatoes cooked more quickly? Cut them into smaller pieces. The smaller the size of the pieces, the less time it will take to cook the potatoes. So if I’m in a hurry and need to prepare them quickly, I will cut them up smaller. So, get cooking with this easy-to-make recipe, and soon you’ll be enjoying these potatoes with your next dinner. 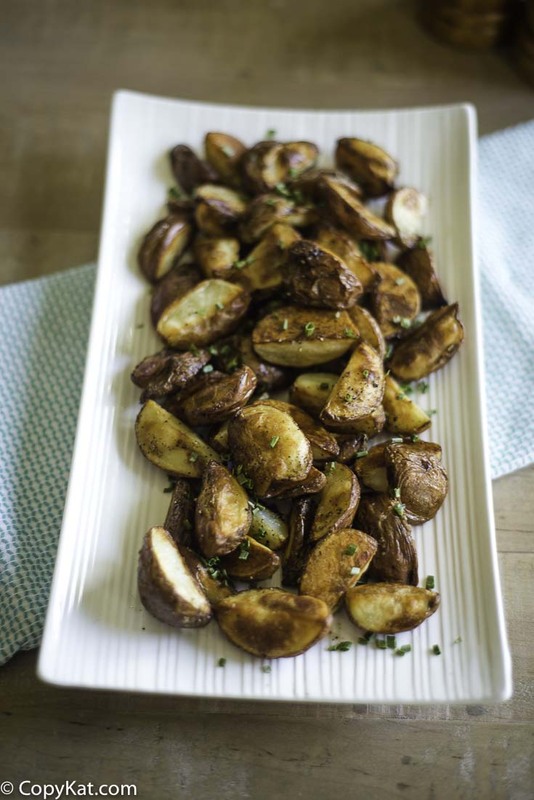 You can also try these other roasted potato recipes. 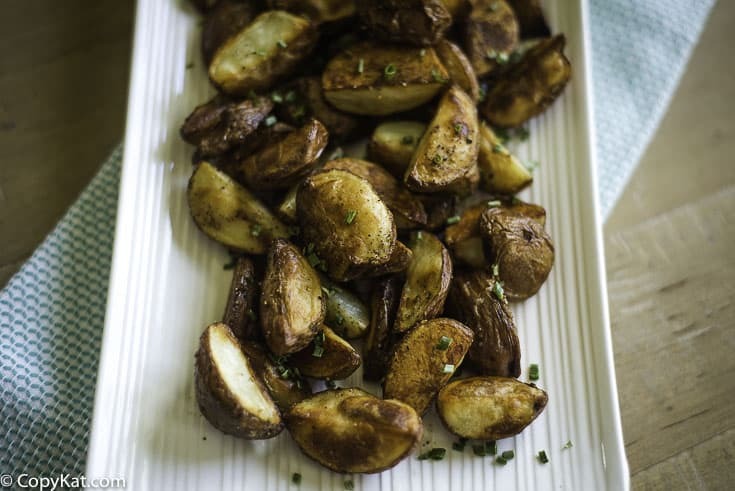 Roasted red potatoes are easy to make in your oven, and they taste so good. Preheat oven to 425 degrees. Wash, and cut potatoes into quarters. Place potatoes in a large bowl and coat with vegetable oil. Stir potatoes to coat them with oil. 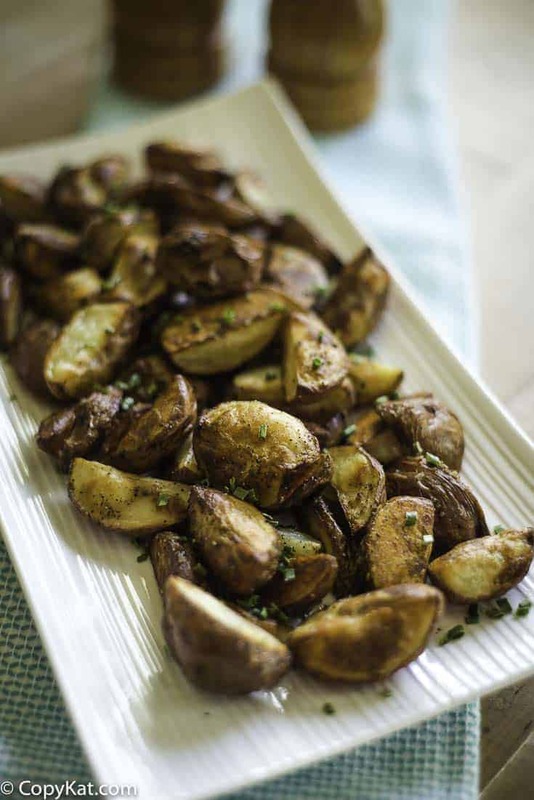 When transferring the potatoes to a sheet pan or baking sheet, place potatoes in a single layer. Sprinkle salt and pepper. if desired. Bake for 30 to 40 minutes or until the potatoes are browned and crisp, they should be a nice golden brown color. You may want to flip the potatoes once during cooking so all sides brown evenly. If desired just before serving you can add fresh parsley. Wow. the best thing its very easy and delicious. Thanks for the recipe. I came across this recipe and think I will try these tonight. Mmm, thank you. I like to put my cut up potatoes in a gallon size zip lock, add drizzle of olive oil, fajita seasoning (in lieu of salt, pepper & garlic) and chopped fresh rosemary. Seal and shake, then dump potatoes on cookie sheet, bake until tender – tossing 1/2 way thru. Yummy!!! I do the same thing with halved brussel sprouts. Also with cut broccoli except instead of rosemary – italian seasoning. Do these come out hard? I have made a similar recipe with regular white potatoes. But all I have on and right now is a bag of red potatoes. I want them to be cooked so they’re soft. If you cook them long enough they will not come out hard. I make something similar. Cut up red potatoes (cut in half then the half’s cut in 2 or 3 depending on size) (do enough to fill casserole dish) put potatoes in bowl then melt 1 stick butter. Pour butter over potatoes and sprinkle dried parsley over the top (1 T). Sprinkle with S&P, mix well and put in a glass dish 8×8. Cover with foil to seal and cook at 400 degrees for 1 hour. Very tender and tasty. What is the topping you put on the potatoes in the picture? Nothing indicated in recipe! Hate that, when my makings don’t look ike the picture in the recipe. Would like a reply. Thank you for pointing out I failed to put that I added parsley to the finished potatoes. I should have done that. Those are my potatoes that I made for the recipe. I was wondering how to cook them if I have the oven at 350F? I want to do it while making a roast beef. Just a quick tip on cooking oils. While olive oil is great, I agree it’s not always the best oil to use. I suggest always using an oil with a smoke point higher than the temperature you’re cooking at. In this case, olive oil has a fairly low smoke point, and baking at 425 will break down the oil in ways you really don’t want, in fact producing carcinogens. And instead of using a highly processed oil such as, for example, Wesson vegetable oil, you can very easily make something like clarified butter or ghee right at home in a sauce pan, some cheese cloth, and a strainer, and use that as your base oil for higher temperature cooking and baking. I also like to use tallow for a higher cooking temperature, but for a recipe such as this, I’d go with the clarified butter for that subtle bit of rustic flavor it adds to the potatoes. microwave potatoes 2 mins flip and repeat. Then follow receipe except cook only 15 Min. This could be important if you only have one oven. You can entirely cook potatoes while meat is resting. I fix these all the time, except I use olive oil,garlic (minced), salt & pepper & rosemary. They are delish!!! I love your addition of rosemary. You really nailed it on this photo, gorgeous!